Crystals have acquired tremendous popularity since the 1980s. They are at the heart of the tools of the communication field crystal transistors and computer chips. But aside from technological uses, they have been found to be excellent tools for inner communication as well. Each crystal bowl is made of 98.9% silicon quartz. One reason why the pure tones vibrate our body is that the human body has a natural affinity to quartz. Our bones, blood and DNA are crystalline in structure, as is our brain. Even on a molecular level, our cells contain silica, which balances our electro-magnetic energies. This is the same formula of silica as natural quartz crystal. Thus, when the crystal bowl is played, the crystalline cells in our bodies begin to vibrate at the same frequency as the bowls. If we know the optimum sounds and notes to bring our bodies into healing, we can logically use those notes to entrain the cells in our bodies to reach the optimum, healthy, balanced vibration. . 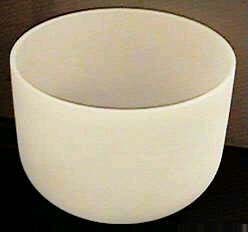 The quartz crystal bowl is based on the ancient Tibetan singing bowls. Tibetan singing bowls are known for their exotic sounds, which hover in the air long after they have been played. It is one of the most powerful healing instruments of sacred sound, with many uses. It is generally recognized that they were created specifically to elicit tones for healing and ritual purposes. This same principle applies to crystal bowls. The quartz crystal bowl is a dynamic symbol of this linking of ancient mysticism and new high technology. It is rooted in the mysticism of the past, but it is also a bridge to the wondrous mysteries of the future. It harmonizes the heart and mind with the physical with the spiritual. The Priests of ancient Egypt knew how to use vowel sounds to resonate their energy centers or chakras. There is a direct link between different parts of the body and specific sounds. Such a technique appears extremely old, yet healing through sound goes back even further- even perhaps, as far back as Atlantis where the power of sound was combined with the power of crystal. Many cultures recognise the importance of music and sound as a healing power. In the ancient civilizations of India, the Orient, Africa, Europe and among the Australian Aboriginals and North American Indians, the practice of using sound to heal and achieve balance from within has existed for many years. The Tibetans still use bells, chimes, bowls, and chanting as the foundation of their spiritual practice. In Bali, Indonesia, the echoing gamelan, gong, and drum are used in ceremonies to uplift and send messages. The Australian Aboriginal culture and Native American shamans use vocal toning and repetitive sound vibration in sacred ceremony to adjust any imbalance of the spirit, emotions or physical being. At the present time, the Hopi American Indian prophecy is being fulfilled with the "Coming of the Rainbow People", through the keepers of the crystal bowls. This ancient wisdom has emerged to heal and uplift the consciousness of the universe through pure crystal tone. The American psychic Edgar Cayce, and German philosopher, educator and artistic genius Rudolf Steiner, both predicted "pure tones will be used for healing before the end of this century". Nostradamus foretold the healing of cancer through pure tone by 1998. The pure tones created by crystal bowl music enters as a fulfillment of this prophecy. Through the pure crystal tones, as the sound effects brain wave activity, one can travel into an altered state of consciousness. As different parts of the brain are affected, it is probable that they can release different hormones and neuro-chemicals which can suppress pain, strengthen willpower in one's creative talents and to overcome addictive patterns..
Edward Back, M.B., B.S., D.P.H., author of Heal Thyself, An Explanation of the Real Cause and Cure of Disease, 1931, and founder of Bach Flower Remedies, clearly understood illness as a reflection of disharmony between the physical personality and the soul. He states the cure is to balance the magnetic qualities of the higher subtle bodies. Through pure tone one can re-pattern the energy field organization that ultimately effects the cellular expression of disease or wellness. Crystal bowl music is all the more powerful as it can be programmed; quartz crystal, as a holographic light template, is able to hold, transmit and receive thought forms. It is fundamental to the memory "mother boards" of all computers. It is interesting to note that dolphins and whales are thought to communicate through 3-dimensional holographic thought forms. Jonathan Goldman in Healing Sounds, the Power of Harmonics, 1992, writes, "the intention behind the sound is of extreme importance. It may, in fact, be as important as the actual sounds that are created". The power of thoughts is the means by which we create our reality. Nothing can be created if it has not first been thought. When using crystal to heal, the crystal amplifies the thought programmed within. The crystal has this amazing property and thus it can be used to bring out a special quality or feeling in people and simultaneously release and replace thought forms that are not of the highest radiance for the listener.